When the Christmas market was held in 1928 in Vienna for the first time, it was called „December“. Currently you can visit the market as of the mid November. In order to taste the feeling of Vienna before Christmas without any limitations, we recommend transport without own car. The market is organized on a number of places, which are easily accessible by underground or in our limousines. 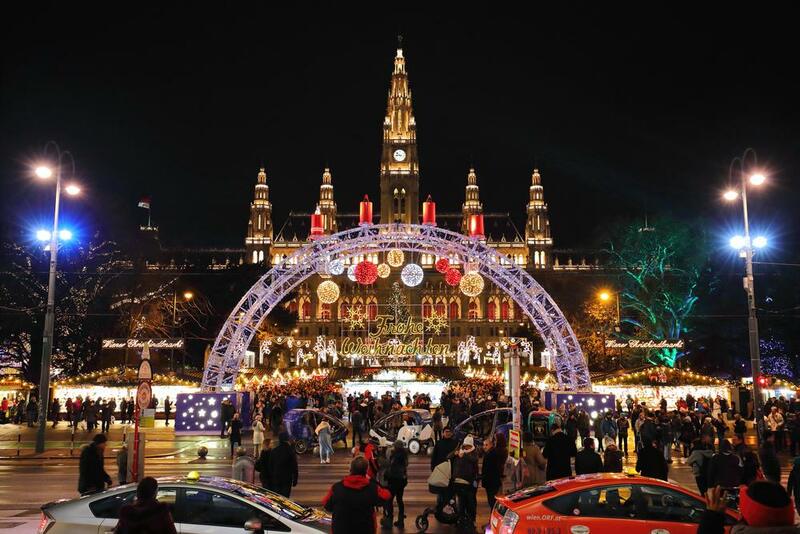 Thanks to thousands of small lights, Rathausplatz changes every year to a magical country with a heady smell of the Christmas punch, candied fruits, cinnamon, mulled wine, cotton candy or chestnuts. The biggest Christmas market in Austria attracts everybody with 150 stands, where you can find everything what you could wish for a Christmas market: decorations, toys, art and handicraft products or traditional Christmas delicacies the taste of which is extraordinarily in this atmosphere. The nearby park with small pavilions and decorated trees, ponies for the youngest ones and the Christmas express make the market an unforgettable experience similarly to the large ice rink and a rich programme for all age categories. Between the Museum of Art and History and the Museum of Natural Sciences are scattered nearly 70 stands with beautiful gifts and indispensable delicacies that are consumed in the village accompanied by gospel melodies. Also those will like it on the Mary Theresa Square who do not need crowded alleys to feel the Advent happiness but, on the other side, they like to munch on typical Austrian Christmas delicacies, also after Christmas. As on the 27th December this Christmas market changes to New Year market. Freyung Square remembers Christmas market since 1772. No admirer of ceramics, decorations, cots and remarkable handicraft products shall miss it. Those who are looking for high-quality Austrian products, should check the offer in the Christmas stands in front of the St. Stephan Dome. The ones who are keen on extraordinary dose of romance, should definitely visit Ehrenhof in front of the Schönbrunn castle. The cultural and Christmas market with a tint of imperial nobility belong among the most beautiful ones in Austria and also the lovers of classical music concerts, gospel, but also wind ensembles will find what they are looking for. The children will definitely be happy to see the Christmas crib, Bethlehem and the Christmas workshop, the hungry bellies can be filled with gnocchi, speckles, dumplings or pancakes from top chefs. With a nice tea or punch in your hands you can choose from ceramics, Christmas decorations, woollen hats, artistic puppets, gloves, candles, tablecloths, tin toys or musical clocks.